Like virtually every other home cook in America, I recently got an Instant Pot, a brand of electric pressure cooker and slow cooker combo that has become a word-of-mouth hit. While I use it for everyday meals, the electric pressure cooker has a feature that makes it particularly indispensable for holiday use: You can set it and forget it. On past Halloweens, whether I'm cooking the pre-trick-or-treat supper or heating up apple cider, I have found myself running between the stovetop, the front door, or my kids' bedrooms where they are getting into their costumes. This year, I know I will set up whatever I'm making in the instant pot and then walk away to deal with everything else. Start the sugar overload first thing in the morning of October 31 with this gooey, fragrant version of apple cinnamon rolls. Hey, at least the kids will have some fruit before school! Especially if the weather is blustery, I like to fortify my trick-or-treaters before they go out. Chili is a favorite for me anyway, and since there are jack-o'-lanterns everywhere, why not throw some healthy squash into the caldron tonight with this squash and turkey chili recipe? I serve mine with a side of mummy dogs, made in the oven. If you were out escorting trick-or-treaters and didn't have time to prepare anything to warm them up on their return, you can use the pot to produce creamy, not-too-sugary hot cocoa in just six minutes, by following this YouTube tutorial. Cheesecake is one of the dishes that made the instant pot famous. To impress at any Halloween gathering, try this adorable cheesecake decorated with a dulce de leche spider web design. If that's not Halloween-y enough, instead of following that plain cheesecake recipe, you could also make a pumpkin-flavored cheesecake to top with the same dulce de leche web. You can even make the dulce de leche in the instant pot. Or if the spider web looks too fussy for you, just chop up some candy bars for a trick-or-treat-themed topping. Perhaps best of all for parties, you can make the same recipes into individual cheesecakes by placing them inside Mason jars in the instant pot. But beware! Cheesecakes need 12 hours to set in the refrigerator, so start this recipe the day before you want to serve it. Need a gluten-free dessert option? This elegant dessert is only a pudding in the sense of an English Christmas pudding, meaning that it's more of a cake. It's also not terribly sweet, making it a nice option for pre-trick-or-treat potlucks when everyone's about to eat a bunch of candy. If you have some kids in your life who you like to give a special treat to on Halloween, this fits the bill. 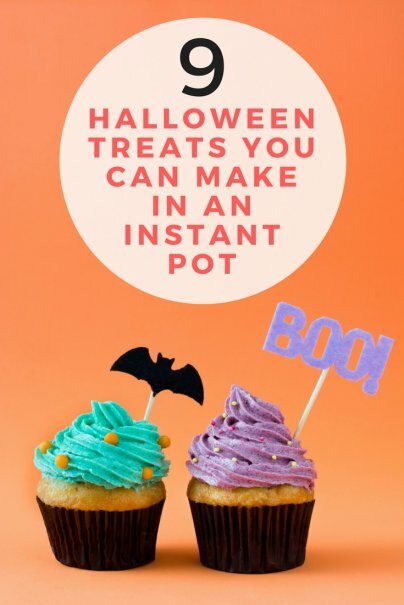 Use the instant pot to melt chocolate, then dip Oreos on lollipop sticks to create spiders, monsters, or skeleton treats. Pies are nice and all, but they tend to take awhile to bake, and this apple crisp recipe cooks in just eight minutes. Serve it with vanilla ice cream for dessert, and save some to have with a dollop of yogurt for a morning-after breakfast. With Halloween falling on a school night again, you'll be grateful you saved something to put on the breakfast table. With pureed pumpkin, a banana, and Greek yogurt on the ingredient list, I'm gonna add this pumpkin Bundt cake recipe to the healthy morning-after breakfast category. Just pretend those chocolate chips are spiders and the calories from them won't count. Or, if that thought terrifies you to your very core, embrace the chocolate chips, because those are always better than spiders.